For your viewing pleasure, I present the fourth episode of the Live from the Sword Coast podcast (featuring recordings of my gaming group’s 5th Edition Dungeons & Dragons campaign). Does a necrotic plague threaten the city of Baldur’s Gate? Are our heroes to blame? Is using your familiar like a coal mine canary a good plan? Find out by pressing play! Please note that this video contains SPOILERS for the Hoard of the Dragon Queen adventure and the Tyranny of Dragons campaign. I hope you enjoy joining our session and, if you have any questions or concerns, please do not hesitate to send them my way at dungeonmusings@gmail.com. For those who may have been following the Live from the Sword Coast podcast (which features recordings of my gaming group’s sessions playing through the Tyranny of Dragons campaign), I thought I would share a campaign summary document that I recently shared with my players. I present this for your review with grammatical warts and all and be advised that the following may represent SPOILERS for the Hoard of the Dragon Queen adventure and the Tyranny of Dragons campaign. 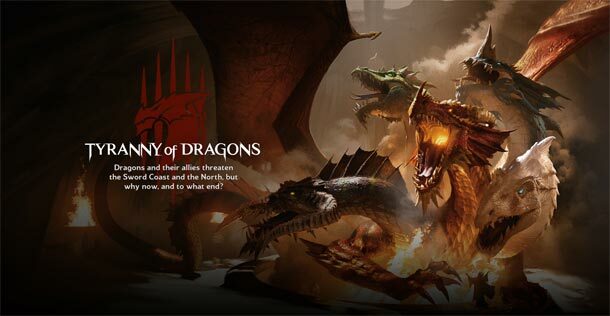 If you intend to play the Tyranny of Dragons campaign at some point, please proceed with caution. Diero Dundragon, Malark Buckman, and Maurgoth met up with Kelvalos Stormwind at the Great Library at Candlekeep, on the shores of the Sword Coast. They realize that they have a common foe, the Cult of the Dragon, and their pooled info suggests the Cult may be up to something at the town of Greenest, a town located roughly 200 hundred miles to the East of Candlekeep, in a wild region known as the Greenfields. Our heroes head there, passing through the Amnian town of Nashkel on the way (where Kelvalos, as an obvious mage, is watched very closely). 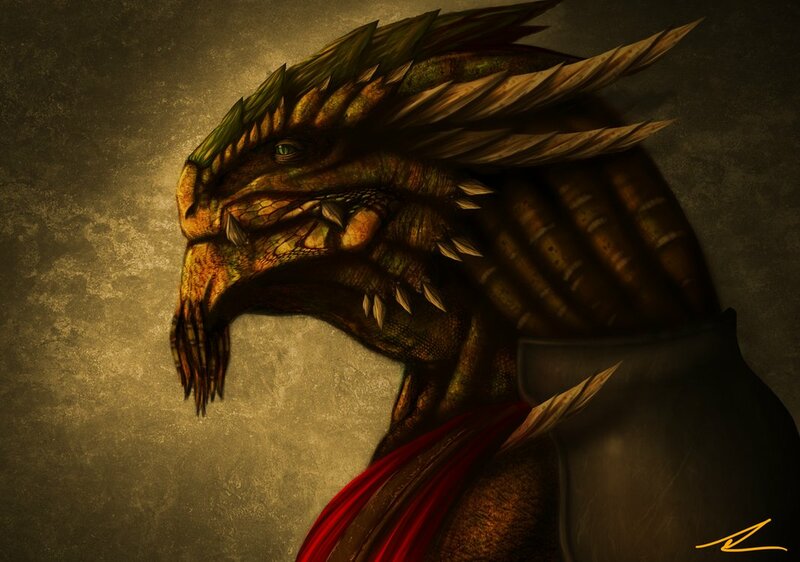 As they arrive in Greenest, they find the find the town under attack by a small army of kobolds, human cultists, mastiff-sized drakes, and an enormous blue dragon.Diving into the fay, they quickly come across Beradin Toraktaalomar, who had arrived in Greenest several days earlier. Our heroes drive off the army and dragon, thanks to a killer combo of Beradin’s divine magic and Malark’s use of a ballista (go team Folk Hero! ).Before they depart, one of the army’s leaders, a blue half-dragon named Langdedrosa Cyanwrath challenges our heroes to a duel and adds motivation by threatening to kill a bunch of captured townsfolk. Malark agrees, but is quickly cut down by the half-dragon’s greatsword. However, as promised, Langdedrosa releases the prisoners and the Cult’s raiding army departs. The town’s ruler asks our heroes to pursue the Cult’s army to its camp and free the captured townsfolk. After taking a brief rest, our heroes make their way to the camp of the Cult, dealing with a small displacer beast problem along the way. Thanks to some clever work by Maurgoth, our heroes gain disguises and make their way into the Cult’s camp without much fuss.The camp’s inhabitants number in the hundreds, if not thousands. Beradin is brought into the camp as a “prisoner,” who is quickly locked up with other townsfolk from Greenest and other nearby communities. 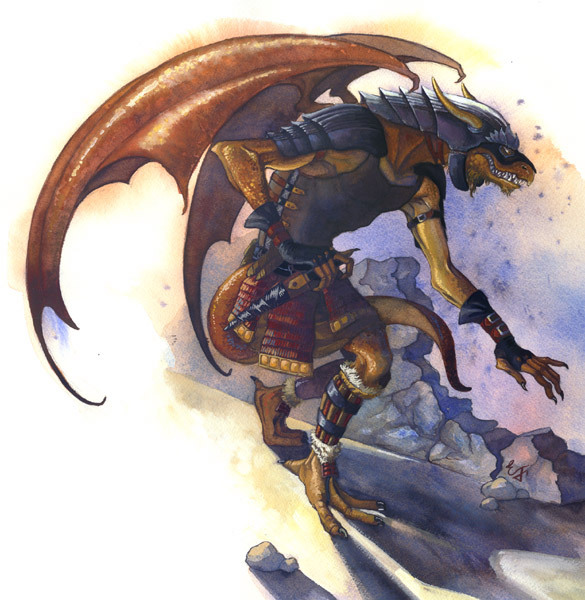 While in the camp, some kobolds recognize Malark as the one Langdedrosa challenged, but quick thinking on his part convinces them that he has come to serve Tiamat now. Diero nearly gets caught when an attempt to steal some of the cultist’s gear goes bad, but he manages to hide himself amongst the large army. Beradin uses his dwarven strength to snap the bonds holding him and he quickly deals with the guards outside the prison tent.While discussing what to do next, they guys are shocked to find that a talking badger has joined them in the tent. The badger turns out to be Wrenn Pock, who is looking for a friend who he believes was taken by the Cult. He tells the guys that a half elf monk is tied to a cross, near the prison tent. The guys free the half elf monk, who turns out to be Brother Leosin Erlanthar, a member of the same order as Malark (the Order of the Sun Soul, devoted to the Morninglord, Lathander). Our heroes also notice a large, well-guarded cave at the back of the Cultist’s camp. With the prisoners in tow, our heroes managed to escape the Cultist’s camp and make their way back to Greenest. Once he has recovered a bit, Brother Leosin asks our heroes to return to the camp and discover what is being done in the cave.He says he say dead bodies being dragged in there (the bodies of townsfolk who were worked to death). Brother Leosin asked that our heroes then meet up with him in Elturel, a trade city to the north of the Greenfields, located on the River Chionthar. 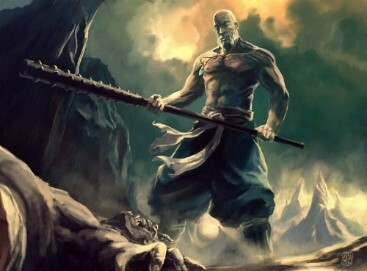 While in Greenest, Malark has a prophetic dream that seems to involve a trio of evil gods named Bane (The Tyrant Lord), Bhaal (Lord of Murder), and Myrkul (Lord of Bones).He learns that all three died during an event known as the Time of Troubles, but that at least one has returned to “life” since (Bane hid an essence of himself “inside” his demigod offspring, which eventually allowed him to return to godhood). Returning to the camp at night, our heroes find it mostly deserted, apart from a trio of hunters hunkered down around a campfire. Our heroes explore the Cultist’s Cave, fighting kobolds, human cultists, and pet drakes. In addition, Malark gets to avenge himself against Langdedrosa and Diero finds some measure of vengeance in killing a Priestess of Tiamat named Frulam Mondath (unbeknownst to the rest of our heroes, Diero’s family was killed by Mondath). Our heroes also smashed a bunch of black dragon eggs. From Mondath’s personal notes, our heroes learn that the leader of the encampment, a Black Half-Dragon named Rezmir (another of the Cultists responsible for the death of Diero’s family), departed with the bulk of the Cult’s army, but he ordered that the loot collected by the Cult in the raids in the Greenfields be taken through Beregost (a town to the West, near Candlekeep) and then north along the Coastal Way, towards Baldur’s Gate, destined for a person or place called Naertyr. Nobody knew who, what, or where Naertyr was, but Kelvalos was sure his friends at Candlekeep could find the answer for him. Our heroes returned to Greenest to rest up. When they return to Greenest, they meet a moon elf sword mage named Carrick Moonwhisper, who also has concerns about the Cult of the Dragon’s activities. While in town, Beradin is informed that the townsfolk wish to erect a shrine to his goddess, Berronar, in recognition of the “miracle” she performed when Beradin smote the blue dragon. They then used the horses left for them by Brother Leosin to being the journey north across the teeming grasslands of the Greenfields, towards Elturel. Along the way, Pock met up with a wemic (a kind of lion centaur) druid named Greymane who represented a group called the Emerald Enclave, who were concerned about the growing power of Tiamat. He asks Pock to assist maintaining the balance and agrees to see if he can located Pock’s half-elf friend. Also along the way, our heroes are attacked by a Land Shark (a bulette), which devours one of their horses. Fortunately, our heroes prevailed and took a trophy from the beast in the form of its tough dorsal fin. Roughly 25 miles outside of Elturel, our heroes are met by members of the Hellriders, the mercenary group that protects Elturel. 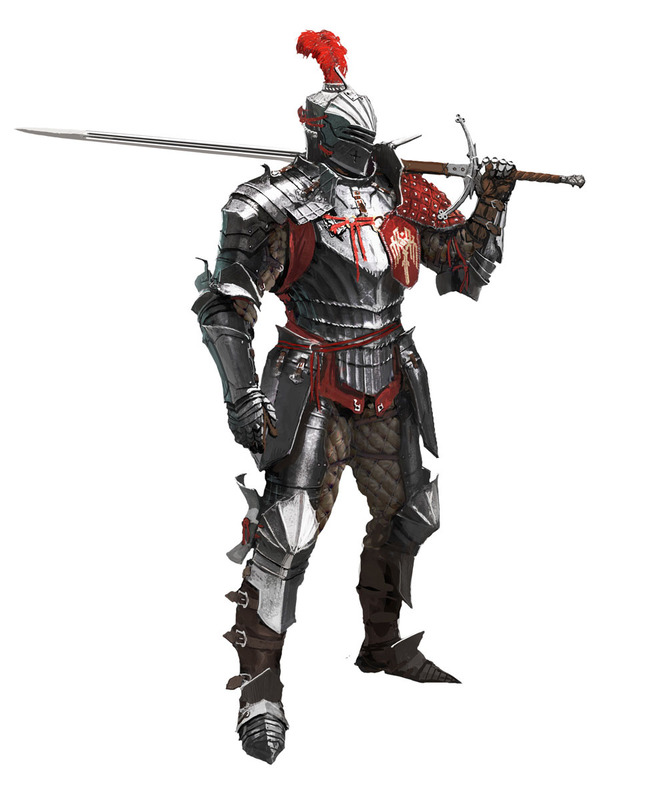 While in Elturel, our heroes meet up Brother Leosin, who introduces them to Sir Ontharr Frume, a paladin of the god Helm, and grandmaster of a group called the Order of the Gauntlet. Frume is initially unimpressed with our heroes. Sir Ontharr challenges our heroes to catch a thief he spies in the tavern (a tavern called the Pair of Black Antlers, incidentally), but thanks to some overindulgence at the tavern, the thief manages to slip away. Beradin learns from the tavern’s owner that the assorted items on the walls of the Black Antlers are trophies donated by adventurers. It turns out that the knife was something recovered from a Cult of Myrkul, centuries ago. The night ends with the patrons of the Black Antlers singing an old tavern song called the Knights of Dragon’s Down.Unfortunately, Malark commits a faux pas when he sings that final verse of the song, which is said to be cursed. That night, Malark dreams of the Knights of Dragon’s Down coming to him on an abandoned, river borne ship. The following day, Malark, Diero, and Carric begin investigations to try and track down the thief.Since there is not official “Thieves Guild” in Elturel, they try gathering information from a local contact he knows by reputation, a smuggler named Mither Mandaroze. Mandaroze tips the guys off that they may find what they’re looking for in the dockworker’s tenement slums, in a northeastern neighbourhood. Maurgoth is mysteriously absent for the next few days. Beradin joins our heroes in the investigations and the four managed to discover that the neighbourhood is being, essentially, held hostage by a cell of worshipers of the god of murder and lies, Cyric. They discover that the cultists have two children who they have threatened to murder if they are revealed to the Hellriders or the Church of Helm (which is powerful in this town). Tracking down the Cyricists to an old leatherworker’s shop, Carric rescues the children, while Beradin, Diero, and Malark kill the cultists, and disrupt a bizarre ritual that they Cyricists were performing involving a rune-etched corpse. After the Cyricists were slain, our heroes looked through their belongings, trying to decipher what it was they were doing.After reviewing religious and philosophical texts found in the cultists’ lair, Beradin guesses that they were trying to trap and destroy/steal the lingering divine essence of Myrkul. 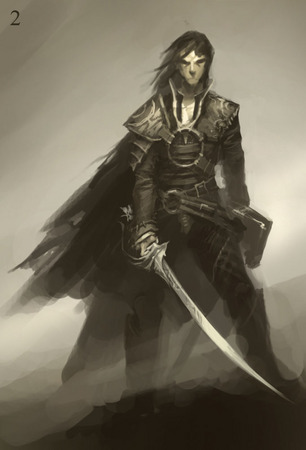 Malark finds the stolen dagger amongst the remains of one of the fallen Cyricists (a powerful, undead warrior), but feels faint and drops the dagger to the ground. Beradin then says some protective prayers over the dagger. Beradin brings the dagger to the Church of Helm for protection (it turns out there is an extensive vault of forbidden items hidden beneath the temple in Elturel) while the rest of our heroes celebrate with the inhabitants of the neighbourhood. Sir Ontharr meets up with the characters in the dockside neighbourhood. He apologizes for his earlier behaviour and invites them to dinner with members of his Order and with Brother Leosin. Diero meets up with Mandaroze, to thank him for the info. Mandaroze asks Diero to repay the debt by delivering a package to someone in Baldur’s Gate. At dinner, our heroes are asked to travel to Baldur’s Gate, a massive city two days West along the River Chionthar, to try and intercept the Cult of the Dragon’s caravan, which they believe is heading north, for Waterdeep. 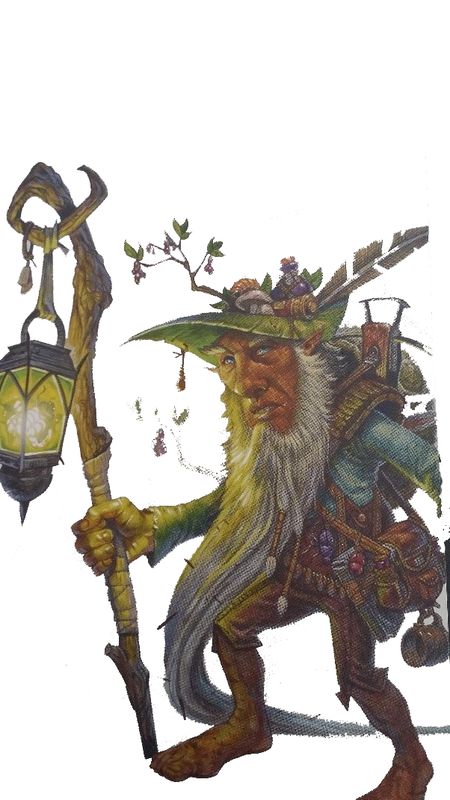 They are to meet up with a local caravan outfitter who will help them join the northbound caravan, once it reaches Baldur’s Gate (it is not expected in Baldur’s Gate for another 14 days). 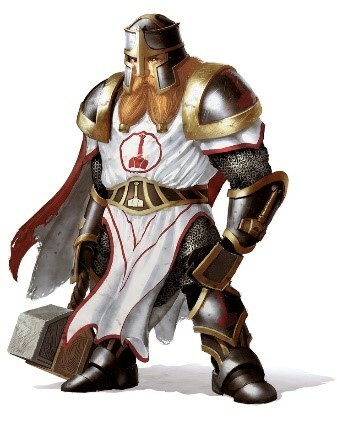 They are also asked to meet with Duke Abdel Adrian, one of the four members of Baldur’s Gate’s ducal council, and try to convince him to help discover and prevent whatever the Cult has planned. 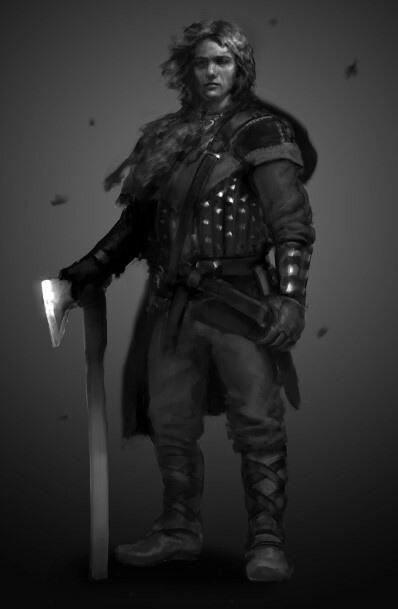 Duke Abdel is an ex-adventurer and is quite influential in both Baldur’s Gate and the Sword Coast in general. Finally, our heroes were invited to join the Harpers or the Order of the Gauntlet, two organizations that are working together to oppose the Cult of the Dragon.Malark joins the Harpers and Beradin joins the Order of the Gauntlet. Our heroes sail to Baldur’s Gate, leaving Maurgoth to catch up (he leaves word that he will meet them in Baldur’s Gate). Along the way, Beradin brews up a cask of potent magical dwarven ale (Wyrm’s Breath Bitter). Our heroes arrive in Baldur’s Gate and quickly find the home of Duke Adrian. After introductions are made, the Duke invites our heroes to join him for dinner at a local Amnian tavern called the Last Coin. At dinner, our heroes learn that the Duke was born in Candlekeep and that his father was the now-dead Lord of Murder , Bhaal.The Duke describes how he had to kill many of his half-brothers and half-sisters over the years (all in self-defence, of course), but that he still feels that some of the so-called Bhaalspawn remain (children with their father’s divinely murderous impulses). This reminds Diero of a legendary assassin from his home city of Athkatla (capital city of Amn) known as the Deathless Killer. At cleric level 4, you know 4 cleric cantrips. Beradin knows the Guidance, Mending, Sacred Flame, and Thaumaturgy cantrips. 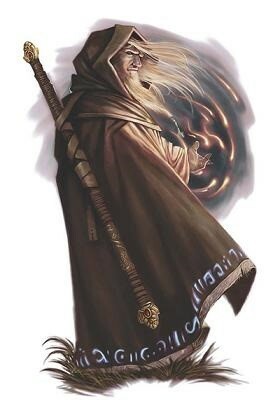 Beradin’s level and wisdom allow him to prepare 9 Cleric spells daily, in addition to his domain spells. Crossbow bolts (quiver of 20), Backpack, Mess kit, Rations (1 day) x10, Rope (50′, hempen), Tinderbox, Waterskins, Healer kit (proficient), Holy symbol (silver), and Spell component pouch. Beradin Toraktaalomar’s Ideal: Sincerity: There’s no good in pretending to be somethign I’m not. Level 2: Four (4) ki points — ki points renew upon making a short rest.